Are you looking for one of the very best pool homes on Windsor Palms? Well you have found it here with this fabulous Orlando vacation villa on one of the largest south facing plots on Windsor Palms. The ultimate in privacy and luxury at our 4 bedroom home Tranquility. 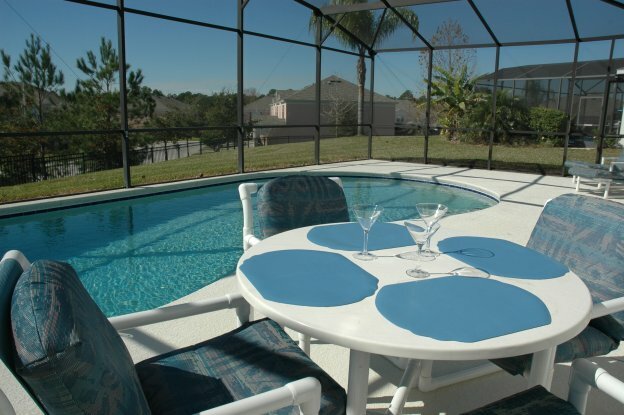 Relax on the pool deck of your Windsor Palms resort home after a day at the theme parks. 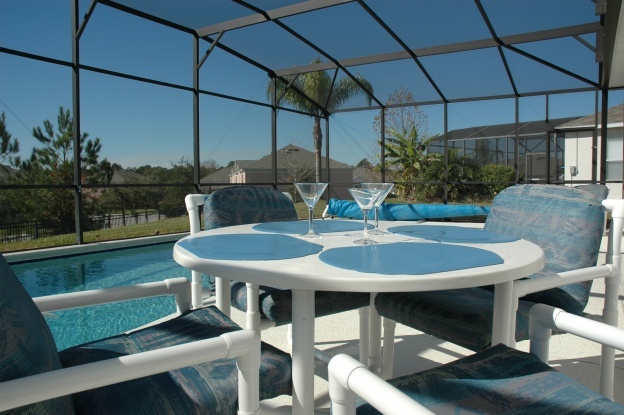 The south facing pool gets the sun for most of the day or sit in the shade on the lanai. 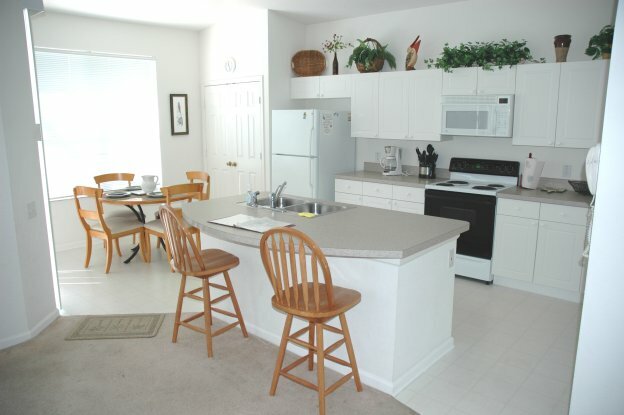 There is plenty of room on the large pool deck and the whole family will enjoy their time in the swimming pool. Many guests say it is the most perfect time they spend on their Disney World Family Vacation. 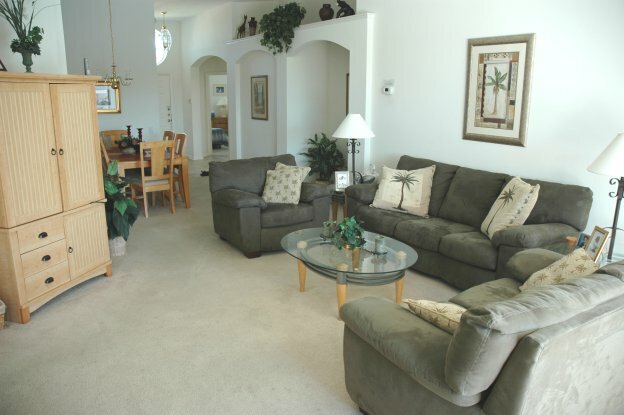 This light and bright open plan living area features comfortable seating – just the place for family gatherings. It features cable TV with VCR, DVD and CD player. The kids will love the PlayStation 2. The house is perfect for more than one family sharing. 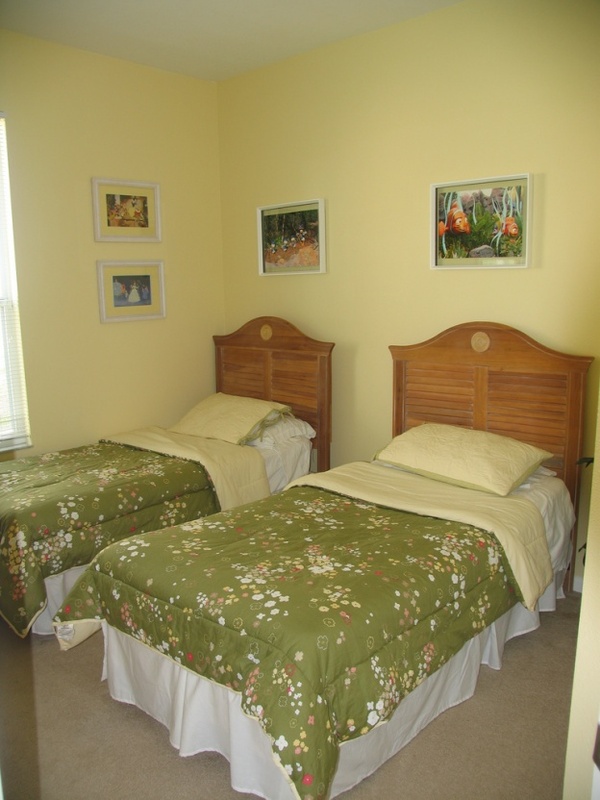 It has 2 master bedrooms and 2 twin rooms. So it's perfect for friends and family enjoying a vacation together. So we know that being on vacation is about taking a break but it is so nice to have a great kitchen there if you need it. You can cook a family meal or heat up a takeout. One of the big money savers of a vacation home is how much you can save on restaurant meals. You will find everything that you need in the fully equipped kitchen – dishwasher, cooker, microwave, refrigerator and freezer with ice maker. There is even a seperate laundry room with washer and dryer. 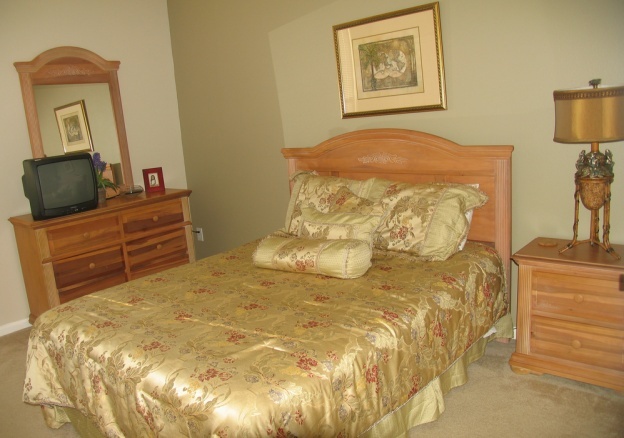 The luxurious king master suite has a 19 inch color TV and large walk-in closet. Your luxury suite is just steps away from the private swimming pool. 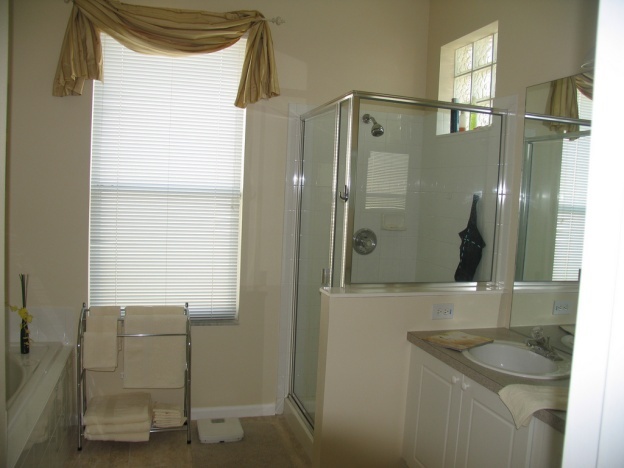 The luxurious master bathroom has a huge seperate shower enclosure, large Roman tub, twin sinks and a seperate toilet. 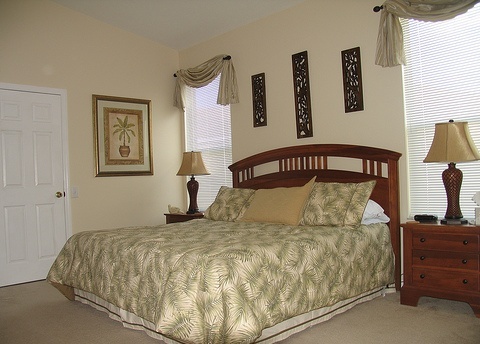 This elegant second master suite has a queen sized bed and cable TV. 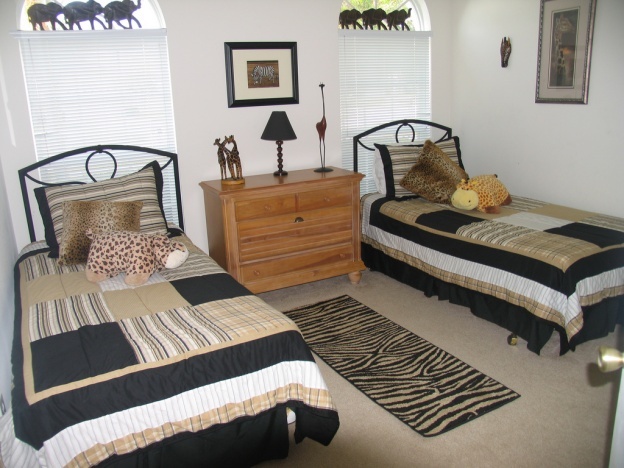 You don't have to go far to find your own Animal Kingdom theme. It's right here in this twin bedroom. But if you want to go to Disney's Animal Kingdom you can be there in less than 8 minutes from this Windsor Palms home! Do You Want to Find Nemo? Well he's right here with the Disney Princesses in this twin bedroom. 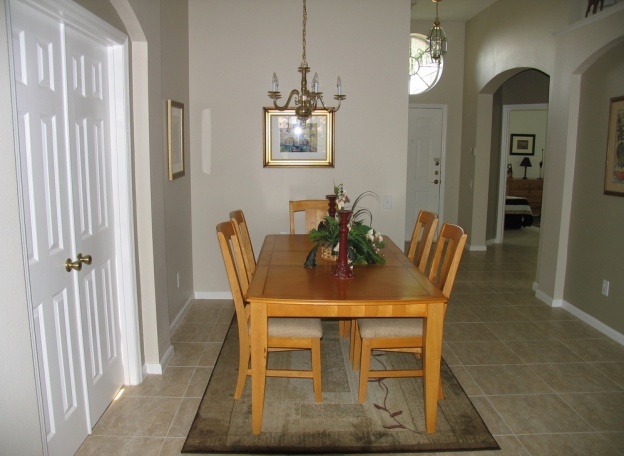 There are plenty of dining options in your Orlando Vacation Home. The dining table comfortably seats 6 people with space for 4 more in the breakfast nook. Prices are shown on the Windsor Palms Resort Rates page.